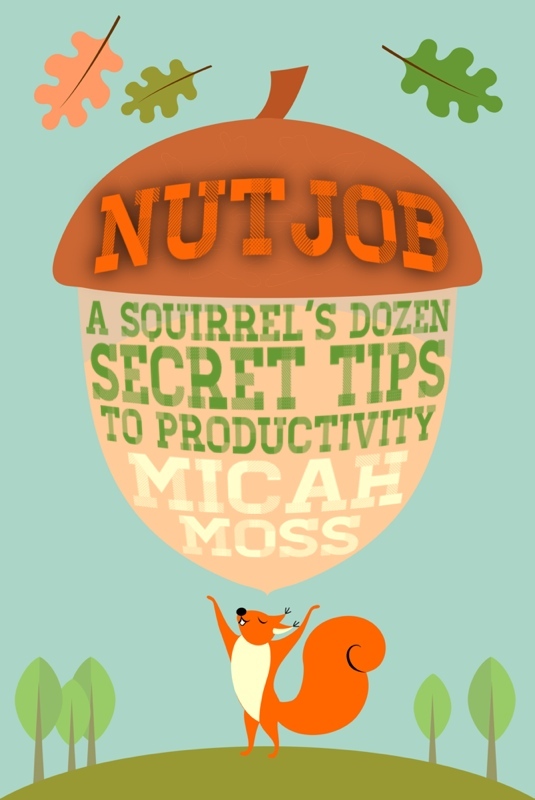 A big welcome today to Micah Moss, author of Nutjob: A Squirrel’s Dozen Secret Tips to Productivity. Pauline: Was writing something you always wanted to do? How did you get your start? It wasn’t until I studied the art of screenwriting (ironically) that I fell in love with writing. After reading tons of books on story arc, structure, and simply watching films with an analytical eye—I started to see what a classic “hero’s journey” was. Then I was hooked. Pauline: Seems pretty clear that Nutjob was inspired by squirrels. J What made you go from watching them in the park to writing a book? Micah: I sort of had a “why the hell not?” moment! When I explore an idea, and realize I can tell a compelling story on multiple levels (even if it doesn’t have a traditional narrative, like non-fiction), then I get stoked. Again pulling from my screenwriting background, I enjoy “high-concept” ideas that are unique, with a compelling “poster” that an audience can instantly “get,” but I’ll only agree to spend a ton of time on the concept if there’s something more to it. If I can tell a timeless message underneath it all, then that gives me the satisfaction to see the project through. I’m also attracted to small, intimate ideas (like the work habits of squirrels), blown up and magnified so the implications seem huge! I enjoy that dichotomy and juxtaposition. Pauline: Is there a particular squirrel tip that’s a favorite of yours? Micah: Hmm… They’re all a bit goofy and endearing; I’d have to say for me as a writer “A Squirrel Without A Cause” (aka Be A Rebel) is important for me to remember. Sometimes, you just have to go “rogue.” Writing is, in a way, an act of rebellion. A writer rebels against distractions, complacency, the status quo, The Man (!) on a daily basis. The act of creation is urgent and beautiful, and I never want to apologize for that. In a world where we’re told what to think and buy and consume 24 hours a day, 7 days a week—we need to retain our independent thought, and writers bear the responsibility of making that voice sing. Pauline: Works for me—so what do you love to cook? … So, you once mentioned having a special writing place, care to tell us about it? Any writing quirks? Micah: So there’s this dungeon I keep below Chuck E. Cheese … Ahem. Seriously? I have multiple “special places” I try to keep available. I’ve converted my garage to an “open-air” writing studio (affectionately dubbed the “Garagio”); sometimes I write at libraries, coffee shops, colleges, you name it. For me, the major consistent I keep across all these locations is the workflow. I’ve become a huge fan of timed writing; I use a technique similar to the “Pomodoro,” but I generally use shorter writing spurts, i.e. 10-15 minutes writing with 5 minute breaks, etc. I love the sense of urgency; it’s like having little mini-deadlines, and also tiny rewards built into it. For those writers out there interested in this kind of workflow, I highly recommend the iPhone app “Phocus.” It’s so well made (I would go so far to say “artisan-crafted”), I could talk forever about it, but it’s just wonderful, so buy it. Pauline: My “garage” is an unheated shed—don’t think that would work out too well for me as a work space in winter here in Northern Ontario. An open air work space sounds great though, maybe I’ll have to try working out on the deck this summer. When I get those done, I outline the rest of the meat in the middle. I used to be hyper-specific in my outlines, but then I realized that was probably a subconscious form of procrastination. Now, I know I need to leave some surprise for the writing process itself, and give the piece and characters room to speak as I work. Micah: Whoa. Biggie here … A life-changing moment for me occurred on an Oregon beach in high school. I grew up in the Redwoods, so I was surrounded by nature’s beauty from an early age, but this one moment hit me like a ton of bricks. I was beach-combing at low tide, looking in the craggy rocks for colorful sea life. All sorts of vibrant sea stars and crabs in every color of the rainbow tried to hide from me. Then I came across something striking. A tiny seal pup nestled in the rock. Alone. I looked around. Was this thing beached? It looks stuck? Where’s its mom? I assumed the mother was away hunting, but I couldn’t turn away. This silver, football-shaped (and sized) creature was sleek, shiny, and the cutest damn thing I’d ever seen. Giant, almond-shaped black eyes peered up at me longingly. It truly looked like an alien. Its little tail was a clover-shaped nub. Amazing. I wanted to pet it! I knew it was a stupid idea … It could bite me and I could get sea-rabies! But I HAD TO. I needed to touch this thing from another universe. So I carefully lowered my hand to its back (away from its mouth) and touched it. It was so soft and slick. In this moment, I felt … close to God. I realized how big and complex this world is, and how much beauty we humans will never see in the abyss of our oceans. It was kind of my “James Cameron” moment. Pauline: Wow, that certainly is an incredible experience—to be in that place, at that time—amazing! What books do you have available to date? Micah: Right now, only NutJob. Micah: I’m only doing eBooks for now. If someday I’m with a traditional publisher, then I’d of course explore it—but honestly I hate the waste in the “dead-tree” model of publishing. So many thousands and thousands of books reaped, only to be schlepped again to recycling. Just so much waste of transport and fuel. I love holding traditional books, but I’ve come 360 on the whole eBook thing as a reader. I pretty much only buy eBooks now because of the ubiquity of having that on my iPad, iPhone, computer—anywhere. It’s truly magic. Pauline: I’m with you on that one! Those who have read previous interviews will already know I’m a huge fan of eBooks. Micah: I’m working on an urban fantasy trilogy. The books are named Lark Shaw & The Doomsday Sketch, Lark Shaw & The Blood Pigment, and Lark Shaw & The Burning Canvas. I won’t go into great detail about it yet, but I can say that it’s a colorful, modern vision of the Apocalypse. 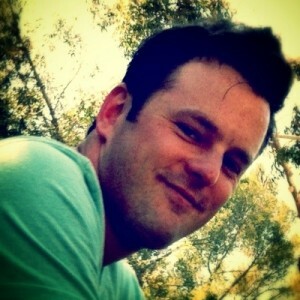 Micah: Write for you—an audience of one. Only write what you love reading, what you love experiencing. If it’s not interesting and there’s no wonder in it for you—that will absolutely show. By sticking to what you love, your passion will shine through and the audience will sense that spirit and find you. Pauline: Great advice for anything! It’s all too easy to get caught up slogging through mundane day-to-day matters to take time for the things we really enjoy. Micah: Meanwhile, back at Chuck E. Dungeon … I’m a pretty low-key kinda guy; I love watching Mad Men, The Walking Dead, Dexter, anything Batty by Christopher Nolan ... I dig coffee, and the whole concept of “slow-cooking” in a crock-pot. I also direct short films, act, and create visual art (mainly digital these days). Pauline: I hear congratulations are in order as you’ve just become one of the “artist partners” for One Day’s Wages! How did you find out about them? Micah: Ah, thank you! How did I find out about them? I think I started googling charities from the Northwest, and also possibly charities that work with partners? Pauline: What makes ODW special? Micah: ODW is incredibly ambitious in scope, but entirely practical in how they raise funds. ODW seeks to eradicate extreme poverty. (Some tiny feat, eh?) How they go about it is unique; they pick specific towns / regions in impoverished areas, and target a specific problem (i.e. “Lets fund a safe-house for abused women in a town in the Philippines.”) They set a campaign goal (say, $30,000), and then they raise it! Once that’s accomplished, they move to another project elsewhere. Perhaps most intriguing of all is that 100% of your donations go straight to the local project. They’re primarily run by volunteers, and their administrative costs are financed through separate donations (a % of my eBook sales are donated to help sustain ODW’s Operational Budget). Pauline: Sounds like a great cause! Where can we find out more about you and your work? Micah: I’m glad you asked! Before that hullabulloo, I just want to thank you for featuring me here, and most importantly, for being a brilliant editor! Pauline: Thank you very much, Micah, for the kind words and for taking the time to join me here today. 🙂 I’d also like to say a huge thank you to everyone who took the time to stop by and visit! Have a great day! This entry was posted in Interview and tagged charity, ebook, interview, micah moss, non-fiction, productivity, squirrell by Pauline. Bookmark the permalink.